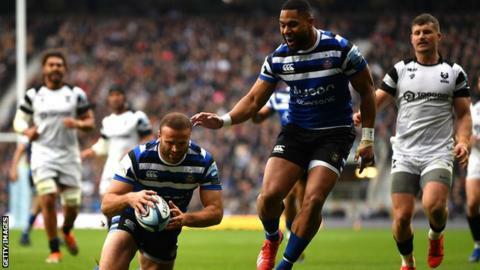 Bath boosted their hopes of being involved in the Premiership play-offs with a 26-19 derby win against Bristol, who are not yet safe from the drop. Twickenham's 60,000-strong crowd witnessed a West Country tussle that was ferocious and physical. Bristol had swathes of possession but had just one try from Dan Thomas and four Callum Sheedy penalties to show. Jonathan Joseph, Jamie Roberts, Joe Cokanasiga and Rhys Priestland all went in to seal Bath a bonus point. It leaves the Blue, Black and Whites just five points behind Harlequins in fourth, the final play-off place, with four games to go, while the losing bonus point for Bristol might prove important in their survival bid. With just seven points separating Bristol from bottom side Newcastle before kick-off, the onus was on Pat Lam's side in their first visit to English rugby union's headquarters since 2016. However, an error after a shift in their own end during the first couple of phases - which was punished by Joseph's quick reactions - seemed to set the tone for the game in the sense of Bristol being adventurous but Bath snapping up the opportunities. Joseph put a wonderful grubber through for Roberts to touch down and another surging move saw England wing Cokanasiga bundle his way across. It came at a cost as Cokanasiga was withdrawn at half-time with a shoulder problem, and indiscipline handed Bristol a route into the game courtesy of Sheedy's boot with three penalties before the break. Both sides ground away after half-time, and it took Priestland's smart response to another Bristol error in their 22 to provide the first score of the second period. Bristol finally got the try their pressure warranted when Thomas raced away on the flank to cross but Bath clung on to ensure a happy trip back along the M4 after a bruising battle. "It was a significant step forward and I couldn't be happier. I thought the club put on amazing occasion and it was just really nice to back that up with a good performance. "We put Bristol under early pressure and got points off the back of that. "We have massive issues with our indiscipline. We basically gave Bristol 12 points and we talked about it at half-time. It's not good enough. "On the performance side we can be better. That's a massive five points for us but there's certainly more in us." "I'm disappointed but also proud of the boys - at 19-3 down they could have gone, but they showed a lot of character to come back and get a bonus point. "Half of our team had never played at Twickenham before, but this experience will help the players grow. We're committed in what we're trying to do and to bringing young English players through. "We're 50 per cent English in the team and there are 70 per cent of young English players coming through. "Getting the bonus point was crucial, but nothing replaces the experience of playing in front of 60,000 at Twickenham. A lot of the guys are buzzing." Bath: Homer; Cokanasiga, Joseph, Roberts, McConnochie; Priestland, Fotuali'I; Catt, Dunn, Lahiff, Attwood, Ewels (capt), Ellis, Underhill, Mercer. Replacements: Batty, Obano, Perenise, Stooke, Reid, Cook, Burns, Clark. Bristol: Daniels; Morahan, O'Conor, S Piutau (co-capt), Leiua; Sheedy, Randall; Woolmore, Thacker, Afoa, Holmes, Vui, Luatua, Thomas, Crane (co-capt). Replacements: Fenton-Wells, Lay, Thiede, Lam, Smith, Uren, Madigan, Pisi.